Aiyana Jones was shot and killed by police executing a search warrant, according to officials. (CNN) -- A Michigan attorney on Tuesday refuted a medical examiner's findings about a 7-year-old girl's shooting death, charging a police cover-up in the incident. Attorney Geoffrey Fieger told reporters that he retained Macomb County Medical Examiner Daniel Spitz to conduct his own investigation. Fieger said Spitz's findings were contradictory to the official Wayne County medical examiner's report that the bullet struck the child in the neck. 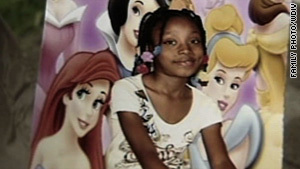 Spitz's report showed that the bullet hit the top of Aiyana Jones' head. It exited through her neck and grazed her chest, Fieger said. He said the report disproves a claim by police that there had been a tussle between officers and the girl's grandmother, Mertilla Jones, inside their house. The grandmother and granddaughter were sleeping on a couch in the front room when the raid occurred. "Certainly there was no time for a struggle," Fieger said. Jones died in the May 16 police raid. Detroit Assistant Police Chief Ralph Godbee has said that preliminary information indicated that officers approached the house with a search warrant for the girl's uncle in connection with the shooting of a high school student last month. Godbee said the officer's gun discharged accidentally inside the home after physical contact with Mertilla Jones. Fieger showed reporters a computer-generated diagram of the shooting, based on Spitz's medical report and a video that Fieger said he has seen. Fieger said it was clear that the gunshot came from outside the home, from the front porch, after police tossed in what's known as a "flash-bang" grenade to startle the residents. "He shot purposely," Fieger said of the officer. "What he was aiming at, I can't tell you. But I can tell you it was not an accident." Fieger has sued the city on behalf of Jones' family, saying that police need to be held accountable. He held up a pair of child's hightops Tuesday -- black with pink shoelaces. They were Aiyana Jones' "princess gym shoes." "My belief is that this is part of a significant cover-up," Fieger said. "Come forward and tell the truth." A state police investigation is ongoing.